As I mentioned in a recent post, one of the key principles of an anti-inflammatory diet is to choose foods that are as nutrient-dense as possible. That’s what makes homemade pesto such a great addition to an anti-inflammatory diet: it is packed with phytonutrients, antioxidants, vitamins, minerals, and omega-3 fatty acids. It’s also a bit of a culinary chameleon, easily fitting into recipes as an ingredient, marinade, or condiment. 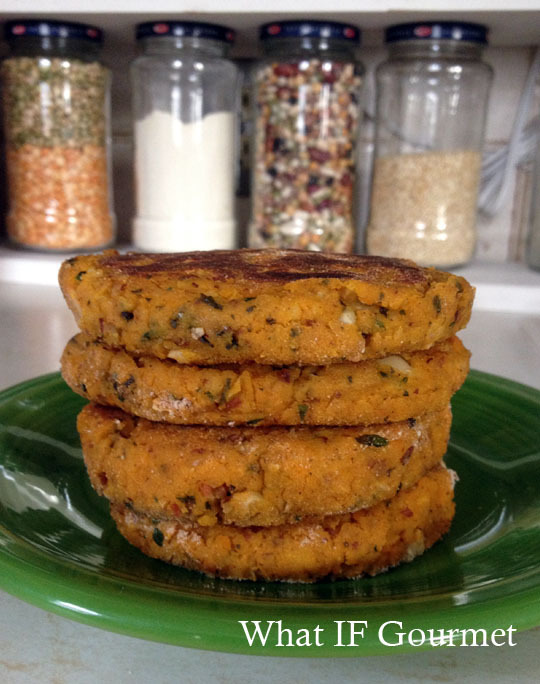 “Pesto Patties” — pureed cannellini beans and winter squash combined with homemade pesto. Traditional pesto combines garlic (which, like all alliums, is powerfully anti-inflammatory) with basil, pine nuts, parmesan cheese, and olive oil. Since dairy is one of my inflammation triggers, I leave cheese out of our homemade pesto, but if you can tolerate it, then by all means add a few tablespoons of finely grated, hard cheese like parmesan, romano, or asiago to your recipe. Other nuts besides pine nuts taste great in pesto, but if you or a loved one has a nut allergy, you can leave out the nuts altogether and substitute pumpkin seeds or hemp seeds. Playing around with different herb combinations will change up the flavor and add nutritional variety. And extras like a little citrus zest or spices can also add extra flavor and health benefits. Another great thing about making your own pesto is how forgiving it is. A little short on nuts? Splashed in too much olive oil? It doesn’t really matter — you can easily make adjustments, and it’s still going to taste good. Sometimes I like to make my pesto a little drier, for example, if I’m going to use it inside a gluten-free calzone, while I might loosen it up with additional oil if I’m going to use it as a marinade. Pesto is delicious as a sauce on homemade pizza, or tucked inside calzones. Stir pesto into tomato sauce, pour the mixture over some chicken breasts, cover, and bake for an easy dinner. Marinate fish, chicken, or lamb with pesto before grilling. Top your beef, salmon, or veggies burgers with a dollop of pesto. Blend pesto with soaked raw cashews and broth into a creamy sauce for chicken or pasta. Combine 1/4 cup olive oil and 1/4 cup balsamic vinegar in an 8 0z mason jar, add a tablespoon of pesto, screw on the lid, shake, and presto! — homemade salad dressing in less time than it took you to read this sentence. 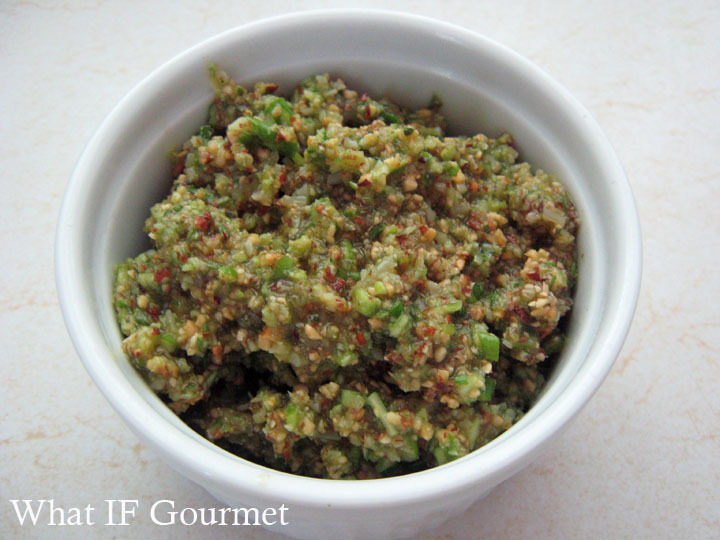 Stir pesto into mashed potatoes, guacamole, or hummus. Puree pesto with cooked, drained cannellini beans and a squeeze of lemon for an easy, healthful, and flavorful dip. 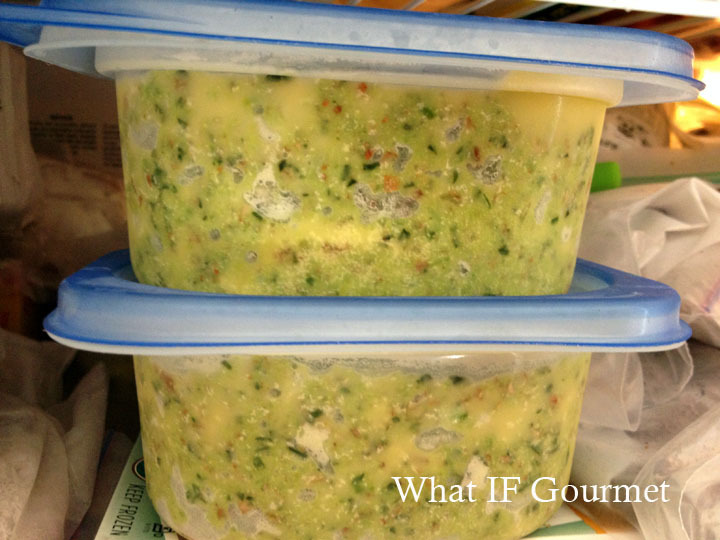 Pesto frozen in 1-cup containers. The ways to use this nutrient-dense mixture are limitless, so I like to whizz up a big batch and freeze various portion sizes (1-cup containers and ice-cube trays) so I always have some on hand when my cooking needs a quick, flavorful, anti-inflammatory boost. Here are some basic guidelines for experimenting with your own special pesto blend. 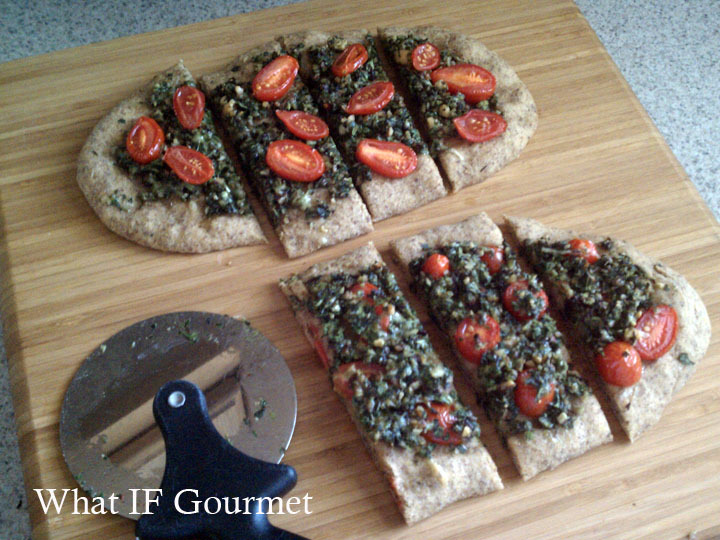 Pesto can be enjoyed raw, so if you’re not sure about a new ingredient, try adding just a little and taste as you go. To make the pesto: Add the nuts or seeds and alliums to a food processor and pulse a few times until coarsely chopped. Add the herbs and pulse a few times more. Add the oil (and any extras) and continue to process until the pesto reaches the desired consistency. Salt to taste, if needed. Decant the pesto into storage containers, and pour a little additional oil over the top before refrigerating or freezing. 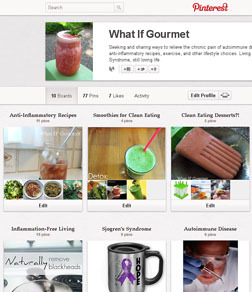 This entry was posted in alliums (garlic/onions), Anti-Inflammatory Ingredients, Appetizers, Dairy-free, Entrees, Gluten-free, greens, herbs, monounsaturated oils, nuts, Recipes, seeds, Snacks, Vegan, Vegetarian. Bookmark the permalink. I love making parsley pesto. Does parsley have IF properties? I’m going to have to make a revised chart! Parsley is loaded with anti-inflammatory and other healthful properties. And also, I totally forgot pistachios. We love pistachios in pesto. What else do you put in your parsley pesto? I love parsley so much. Sometimes I add pumpkin seeds or some pecans, I admit to a little parmesan cheese, if I have some fresh lemons I’ll add a little squeeze of that in. A little pepper. A handful of spinach will round out the bitterness if you don’t like bitter parsley. Sometimes I do that and put it in the bottom of a ramekin, crack an egg on top and bake it until the whites are firm. Hmmm….breakfast is calling! Yum, yum, yum. I wish the Gent liked eggs — baked eggs are wonderful!